Leiper's Fork, Tennessee, is a historic woodsy village about halfway between Franklin and Fairview and about 35 miles from Nashville in Williamson County. This historic town in central Tennessee is on the National Register of Historic Places and is the home of Puckett's Grocery and Restaurant, the most unlikely looking place you could imagine for great food and world-class entertainment. But with a menu that features everything from cornbread stuffing to grilled Atlantic salmon and performances from some of Nashville's most notable tunesmiths, Puckett's is the place to see and be seen. And eat. The area around Leiper's Fork was settled in the late 18th century along the Natchez Trace by veterans of the Revolutionary War from North Carolina and Virginia as payment for their service. 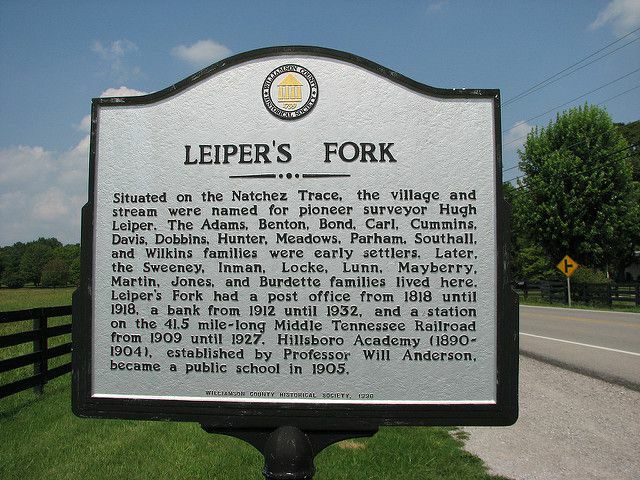 In 1818, the post office was established and the small town formally named Leiper's Fork after the creek that runs through the town; previously it had been called Bentontown and then Hillsboro. Its location on the Old Natchez Trace, a trail more than 400 miles long followed by Native Americans and European and American settlers that crosses three states, brought trade to the area and helped Leiper's Fork to grow. It was on this trail that Meriwether Lewis, of the Lewis and Clark Expedition, died in 1809. The Natchez Trace is now the Natchez Trace Parkway, a premier U.S. scenic byway. Leiper's Fork is a "take me home, country roads" kind of destination, with a laid-back attitude that charms all comers. One of its newest attractions is the Leiper's Fork Distillery, a family-owned venture that is reaching back into Tennessee history as a maker of small-batch whiskey. The distillery gives tours and tastes. Check out the Lawnchair Theatre, in a vintage building, where you can watch movies outside or see live music and other events all year long. But Leiper's Fork has a sophisticated side, too, with a lively gallery scene, a mostly undiscovered antique district, and trendy boutiques. The centerpiece of Leiper's Fork is Puckett's, founded in 1953 by the Puckett family as a general store for the area. In 1998, grocery industry veteran Andy Marshall bought the store and took it down a different path. “Before long, I realized what I had here was a restaurant pretending to be a grocery store. More and more customers wanted the home-cooked meals and cherry-wood smoked meats all within the atmosphere that you can only get at a place like Leiper’s Fork,” Marshall said. He added live country music -- including visits from country music stars that call Nashville home -- along with a menu of outstanding burgers, barbecue and Southern favorites like buttermilk biscuits and gravy, country ham, home fries, grits, catfish, fried pickles, greens, sweet potato fries, cobbler, and chess pie. Rob and Shanel Robinson bought Puckett's in 2008 and have kept the place the same -- but it's now expanded to Nashville, Chattanooga, Columbia, Franklin, and Murfreesboro. But if you want the real deal, go to Puckett's in Leiper's Fork.